Gesture is a patinated copper and galvanised wire kinaesthetic sculpture. It is designed in the style of Alexander Calder kinetic sculptures, with shapes inspired by British Modernist Sculptor Barbara Hepworth. When creating this piece, I took into consideration the principles of sustainability and environmental connectedness Architect Peter Stutchbury uses in his work. The piece, when to sit within its intended context, above a covered outdoor dining table, it has the opportunity to interact with its environment. 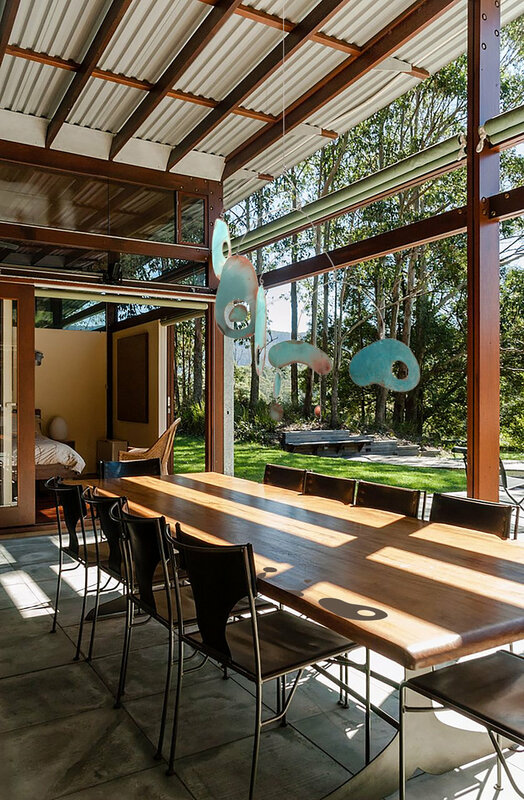 It creates movement and draw on the colours and tones of the building, grounds, surrounding bush and mountains. Like Hepworth, I have brought in elements of the body through the use of curved shapes, negative and positive spaces. They echo the human body and face in the abstract. Each piece is hand sawed, some are textured and there are two domes by hand using a selection of gradated doming blocks, which have then been soldered into the top and bottom shapes. I have then dipped them in a patina bath and worked back into it to create colour and texture. The galvanised wire struts and o-rings are hand formed and carefully balanced, so the work hangs and moves in a poetic way. This work, is designed to move and change with the elements. In time, the colours will mellow and it will settle into its place, gesturing, a body in motion.